This course lays the ground work for defensive shooting. 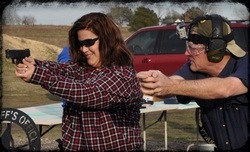 The goal is to teach the basic pistol fundamentals advocated by the NRA. This one-on-one private course establishes solid knowledge, skills and attitude to safely use a handgun in a basic defensive mode. Heavy emphasis is put on stance, grip, breathing, aim and follow through. We will start with dry fire exercises with laser aids, then on to sight picture verification with precision pistol, work on breathing, focus on trigger pull, and finally work on tight grouping with the student's handgun. At the end of this short course, the new gunner should feel comfortable shooting their firearm with confidence on the road to accuracy through consistency and applied fundamentals.